Of the many things that can go wrong with your feet, a corn is among the least worrisome. But that doesn’t mean they aren’t just as irritating. At Allcare Foot and Ankle Care, our podiatrists see a variety of problems, ranging from minor problems to major surgeries. On the foot care scale, corns are fairly easy to get rid of, but it does take time and can be frustrating in the meantime. 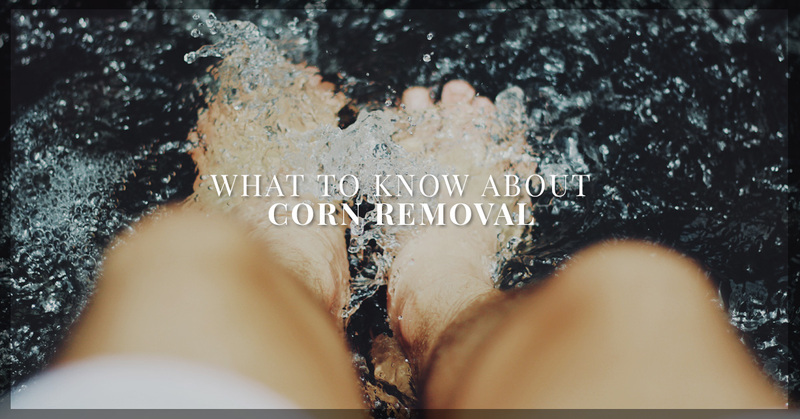 Keep reading to learn all you need to know about corns. If you have additional questions, or if home treatment isn’t successful, get in touch with our Dallas team today for an appointment. Hard Corns: These are generally formed due to pressure from shoes when they don’t fit properly. They tend to form at the top of smaller toes or on the outside of the little toe. Soft Corns: This type of corn is softer because the sweat on your feet keeps them moist. These typically form between the big and the fourth toe. When left untreated, soft corns can become infected. Corns sound a lot like calluses, right? Well, they are fairly similar, but there is a difference in the size and shape. Calluses are larger, wider, and tend to have an edge that isn’t as clear. Calluses form from putting pressure on the area as you walk. Calluses can form wherever a lot of pressure is being put on your feet, or over a bony area beneath your toes, on your heel and on the side of your big toe. Trimming: To do this at home, soak your feet for around 20 minutes to soften the skin and use a pumice stone to gently scrape away the tough layers of skin. A podiatrist can use a tool to more effectively remove the skin. This will reduce the amount of pressure being put on your foot. Chemical: This treatment method is similar to trimming, except that it uses chemical products that will dissolve the skin. One of the more common products is salicylic acid, which dissolves keratin, or what the dead skin is made of. Footpads and Toe Protection: While not a form of treatment, a foot pad inside the shoe can ease some of the discomfort. A toe splint is another option to keep your toes from rubbing against each other. Wearing the right shoe with the right fit is the best way to prevent corns from developing. Before you purchase a pair of shoes, make sure you adequately walk around in them to ensure that there is a snug fit, but not too tight. Speaking of the right shoe, limit your time spent in high heels as much as possible, or wear the lowest heel possible. Wearing high heels is a major cause of corns for women because the toes are pushed together. If you do find a shoe that fits correctly, another line of defense is wearing the right type of sock. If you find that you are developing corns consistently, find a brand of socks that offers more padding. If you have any questions about corns, calluses, or other methods of treatment, give a podiatrist a call today at Allcare Foot and Ankle Care. Our Dallas and Arlington offices are here to ensure you love your feet.